HJ: Harmony in relationships, like harmony in any area of our life, is all about balance. We may be either overly intellectual or overly emotional and therefore struggle with being too distant or becoming attached. Neither truly serve our highest good in the long run. In the short term, they are lessons to be learned so that we may be wiser for the learning, but left unbalanced for extended periods of time, they can begin to wreak havoc in our lives. Balance, as mentioned, brings harmony. That is our challenge — to find and maintain balance between being too distant or too attached — simply being our true, authentic selves in any given moment… open, vulnerable, trusting our intuition and giving our love unconditionally. This is the zen state, the middle ground we all search for and sometimes find. As we continue down the path of self-realization we begin to experience it more and more frequently until it becomes our primary state of being. 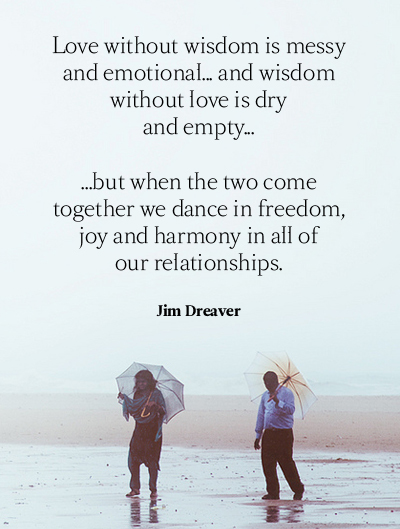 The 28 pearls of wisdom listed below will help you identify and correct any areas in which you may be out of balance in your relationships — romantically, with friends, family and strangers, and most importantly, yourself. Balancing your intellectual side with wisdom and your emotional side with maturity and unconditional love, will help you return to the harmonious state which we all seek, whether or not we are consciously aware of it. This small tip immediately changed the way I treated myself and others. In fact, it set the foundation for all the healthy relationships I’ve nurtured over the years, including my relationship with Angel. The bottom line is that every single one of our relationships starts within us. When we uncomplicate ourselves, we uncomplicate our interactions with others. When we stop doing the wrong things and start doing the right things, our relationships get a lot easier. Final Reminder: Have you checked out our book? We just released a limited time bundle for “1,000 Little Things Happy, Successful People Do Differently” which includes our eBook, audio book and bonus material on sale for a big discount. Click here to check it out! Stop looking to others for the love and respect only you can give yourself. – Self-respect, self-worth, and self-love. There’s a reason they all start with “self.” You can’t receive them from anyone else. Start accepting and embracing your flaws. – Once you’ve accepted your flaws, no one can use them against you. Love yourself! Forgive yourself! Accept yourself! You are YOU and that’s the beginning and the end… no apologies, no regrets. Stop comparing and competing every second. – Take one step at a time and don’t compare your progress with that of others. We all need our own time to travel our own distance. Remember this, and give others the space to do the same. Start letting others be exactly who they are. – Remember, a great relationship is about two things: First, appreciating the similarities, and second, respecting the differences. Stop being insensitive. – Always be kinder than you feel. Yes, be waaaay kinder than necessary. You never know what someone is going through. If you cannot speak a kind word, say nothing at all. Start showing your love. – Don’t just say it; let your actions speak too. Showing someone you care is wonderful, and it’s easy. Sometimes the smallest act of love can take up the greatest space in someone’s heart. To make someone happy, give them three things: attention, affection, and appreciation. Start acting like what you do makes a difference. – You are needed. You matter. Always go above and beyond for those who need you most. In a world full of people who couldn’t care less, be someone who couldn’t care more. Stop letting one dark cloud obliterate the whole sky. – Don’t sweat the small stuff today. Don’t let stupid little daily frustrations interfere with your relationships. Just do the best you can. Live simply. Love generously. Speak honestly. Work diligently. Then let go and let what’s meant to be, BE. Start doing what’s right for YOU too. – Remember, if you care too much about what other people think, in a way, you will always be their prisoner. You can’t live your entire life for someone else. Sometimes you’ve got to do what’s right for you, even if someone you care about disagrees. Stop needing to always be right. – Sometimes we must choose to be wrong, not because we really are wrong, but because we value our relationship more than our pride. Start asking yourself: “Will this hurt someone I care about in any way?” – The bottom line is that you can’t keep hurting someone over and over and expect them to love and respect you. Start noticing the little things. – Pay extra close attention to those you care about. It’s nice when a friend remembers every tiny detail about you. Not because you keep reminding them, but because they pay attention and care. Stop pressuring others into things, or putting up with those who pressure you. – Be patient. Let people decide for themselves. Being willing to wait is a sign of true love and friendship. Anyone can say that they care about you, but not everyone will wait for you. Start using your voice to lift others up. – Let your voice inspire people every day so much that they think to themselves, “I’m so lucky, I have such a good life.” Let your voice be the thing that lights a fire in others, and keeps them going even when it hurts. Let your voice to be the one they hear in their dreams that tells them, you are so loved, you are so wanted, you are a special gift, and you are worthy. Start letting honest mistakes slide. – Lots of relationships fail because we spend more time pointing out each other’s mistakes and not enough time enjoying each other’s company. So remember that EVERYONE makes mistakes… If you can’t forgive others, don’t expect others to forgive you. Stop being dramatic. – Spend less time gossiping about problems and more time helping yourself and others solve them. Stay out of people’s needless drama and don’t create your own. Start forgiving yourself for the pain you caused in the past. – People can be more forgiving than you can imagine, but you have to forgive yourself too. Let go of what’s bitter and move on. Stop letting your expectations get in the way of your love. – Love is simply friendship without unjust expectations. It is a quiet understanding, a mutual confidence, and a commitment to sharing and forgiving. It is loyalty through good and bad times. It settles for less than perfection and makes allowances for human weaknesses. Start being honest about how you feel. – Remember, being honest might not always get you a lot of friends, but it will always get you the right ones. Stop spending time with those who continuously belittle you. – Don’t let anyone make you feel that you don’t deserve the good things happening in your life. You deserve to be happy. You deserve to live a life you are excited about. Don’t let anyone make you forget that. Surround yourself with people who make you a better person – those who inspire you to be your best self. Start giving yourself all the approval you need. – Say it: “I am who I am and your approval isn’t needed.” Just be yourself and let the right people love the real you. Find people who respect you as much as you respect them. Be with those who are happy and proud to have you just the way you are. Start communicating clearly. – Don’t try to read other people’s minds, and don’t make other people try to read yours. Most problems, big and small, within a family, friendship, or business relationship, start with bad communication. Someone isn’t being clear. Start living with 100% integrity. – Don’t cheat. Be faithful. Be kind. Do the right thing! It is a less complicated way to live. Integrity is the essence of everything successful. When you break the rules of integrity you invite serious complications into your life. Keep life simple and enjoyable by doing what you know in your heart is right. And finally, remember that good relationships don’t just happen; they take time, patience, commitment, and two people who truly want to work to be together.